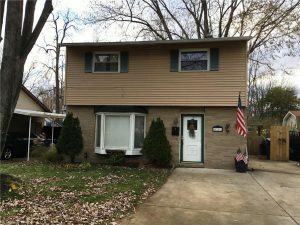 Nothing to do except move into newly remodeled 3 br, 1 1/2 bath colonial featuring large rooms and many updates. Let’s start with the spacious eat-in kitchen boasting beautiful granite counter tops, an under mounted sink and the newly engineered laminate flooring and fresh paint. Conveniently located ff the kitchen is a large utility room and a half bath. The large living room with lots of natural lighting has been newly painted and carpeted. Upstairs are three unusually large bedrooms with hardwood floors and fresh paint. The full bath has also been updated in style with a granite counter, new flooring and custom tiling. Outside you can relax on the large deck that is partially covered for those hot and sunny days. Also new is a full wood fence that allows for both pets and privacy.privacy. To view more more visit our listing page…….